Rapper, Luck-One (née Hanif Collins) hails from Portland, Oregon. A classically-trained musician from early childhood, he began working on a project with his group Seventh Science almost 10 years ago. At the age of 17, however, he was incarcerated and served five years for robbery and gun charges. Working as an activist while serving, he rallied prisoners together who were previously divided, racially. Emerging from prison in 2009 as an exceptional lyricist, he joined with producer Dekk, to release the free EP entitled Beautiful Music, which garnered much critical praise. 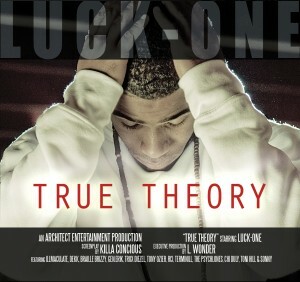 Luck-One’s new release and first official debut, True Theory, is a refreshing collective of consciousness rap with themes full of social and cultural awareness, using uplifting mantras and relaying ideas about life and spiritual philosophies. Vibing rhythms at times with accompanying breezy guitar chords or blustery keys and always wicked runs of drums that delicately frame each track. Deep and charismatic, Luck-One has that formula of crafting tracks where both music and words grip and elevate. “I Believe” begins with the lyric, “I’m trying to balance my vision with my perception, and it’s twice as big as my landscape.” True Theory never falls to cliché but is transforming art with atmospheric beats and has a nicely intelligent, lyrically emotive appeal.